Blood flow assessments (imaging and monitoring) have been made of scerosal surfaces of the gut when exposed surgically. Hajivassiliou et al, assessed blood flow distributions in human colons during operations on six controls and six patients with inflammatory bowel disease undergoing colectomy. Ischaemia demarcation lines were identified before the onset of visible changes. Mucosal measurements are possible with monitoring via endoscopic access. Assessments can be made to check surgical patency post resection, to compare flow in normal and diseased tissue or to monitor flow continuously during other procedures. Ohri et al, 1993 for example, studied the effect of cardiopulmonary bypass (CPB) on the gastric mucosa of adults (GI damage occurs in up to 2% of patients on CPB with significant mortality). They used an endoscopic probe positioned in the gut following retrograde insertion in a naso-gastric tube. This enabled laser Doppler (LD) measurements to be taken with increased stability. Observations included profound reductions in mucosal blood flow during hypothermic phase of CPB despite maintenance of mean arterial pressure (MAP) and flow. A close relationship between core temperature and gastric mucosal blood flow (GMBF) was found, and also between MAP and GMBF. 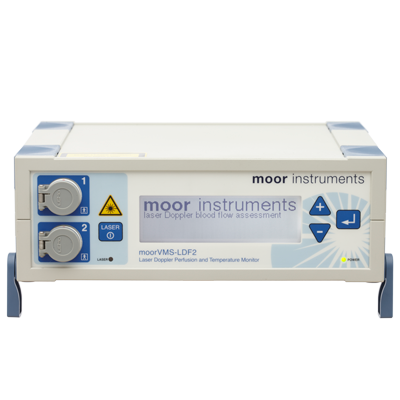 The current equipment recommended by Moor Instruments for a mucosal study would be moorVMS-LDF with a VP6a (end viewing) or VP6asd (side viewing) endoscopic probe. Boyle NH, Pearce A, Owen WJ, Mason RC. Validation of scanning laser Doppler flowmetry against single point laser Doppler flowmetry in the measurement of human gastric serosal/muscularis perfusion. Int J Surg Investig. 2000; 2(3):203-11. Booker P D, Prosser D P, Franks R.
Effect of hypothermia on rectal mucosal perfusion in infants undergoing cardiopulmonary bypass. Br J Anaesth, 1996a, 77, 591-596. Booker P D, Romer H, Franks R.
Br J Anaesth, 1996b, 77, 597-602. Laser Doppler flowmetry as a measure of extrinsic colonic innervation in functional bowel disease. Emmanuel AV, Mason HJ, Kamm MA. Relationship between psychological state and level of activity of extrinsic gut innervation in patients with a functional gut disorder. Hajivassiliou CA, Greer K, Fisher A, Finlay IG. Non-invasive measurement of colonic blood flow distribution using laser Doppler imaging. Br J Surg. 1998 Jan; 85(1):52-5. Ohri S K, Becket J, Brannan J, Keogh B E, Taylor K M.
Effects of cardiopulmonary bypass on gut blood flow, oxygen utilisation, and intramucosal pH.